Hello all!!! Welcome to today's share here at Mrs. Lincoln's Inkin'!!! I hope you all had a safe and wonderful 4th of July. We did. On the 4th we went and purchased all of the new furniture and appliances for our new home! I could not believe all the wonderful sales that everyone was having! I am soooo excited when i get to actually get to see everything in the new house! Then we had fun watching fireworks and then spending some time with our besties and enjoying the sunshine and boat. I got a little burnt :( So today was just a relax/recoop day. Well enough about that, lol, on to today's share. Over the weekend i received the materials from my up-line for this months challenge. For those of you that aren't sure what the "challenge" means here is a brief re-cap. My up-line France Martin sends out materials every month and has us make creations out of those materials (plus whatever else current SU! products we want), send them back to her and then one person out of all that participated receives all of the cards/projects that were submitted. It is really fun!! So this month we were sent a color of each of the new In-Colors, Hello Honey, Mossy Meadow, Blackberry Bliss, Lost Lagoon, and Tangelo Twist. This is what i came up with. I decided to go with the Tangelo Twist for my base and i went with an Easel Card. I hadn't made one in awhile. 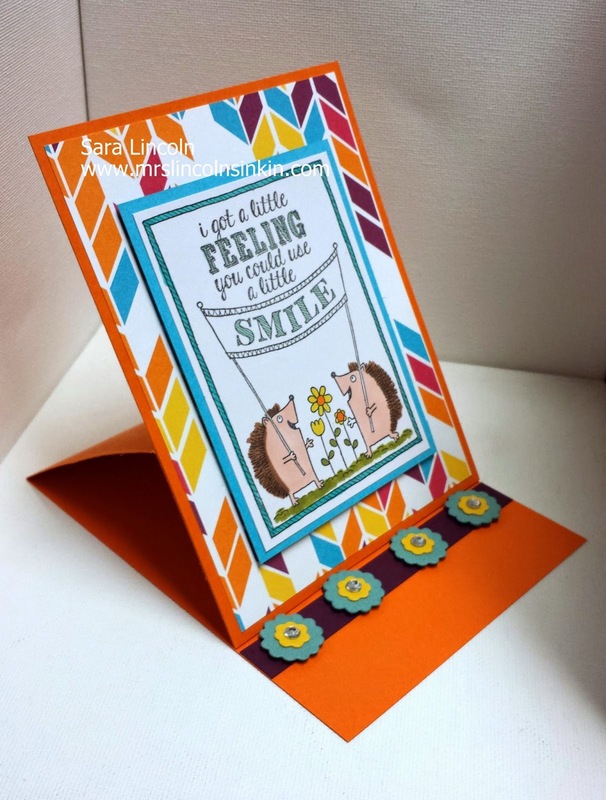 The average size easel card is super easy to make. You cut the base of your card like normal... measuring 4 1/4" x 11" and then score at 5 1/2". 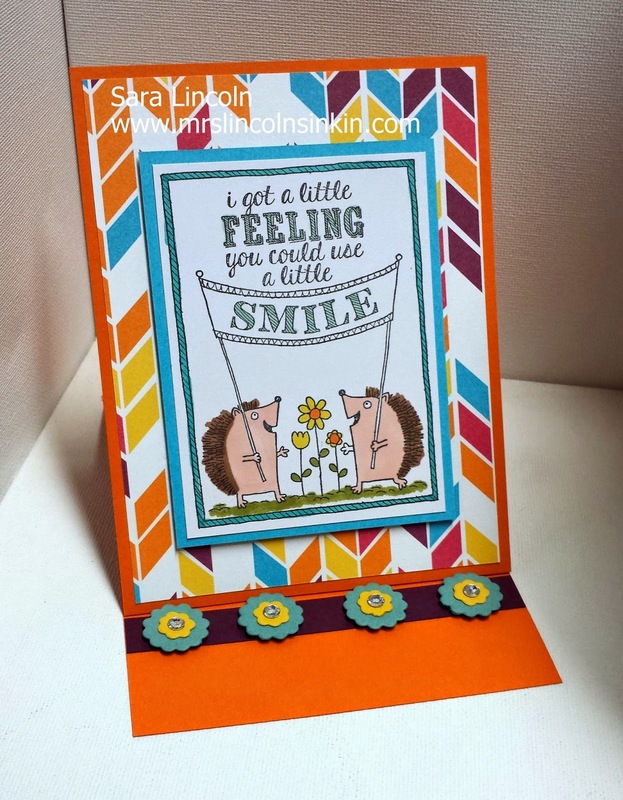 Now you will have the front flap and back flap of your normal card. Take one of the flaps and score it again in half. Then you cut an additional piece (the front panel) at 4 1/4" x 5 1/2". Adhere that piece underneath the score mark you made on the one flap of your base card, ONLY PUT SNAIL UNDER THE SCORE LINE. Then you just have to decide what you want to use to hold your card up while it is sitting out on the table... Here is another angle of the card. 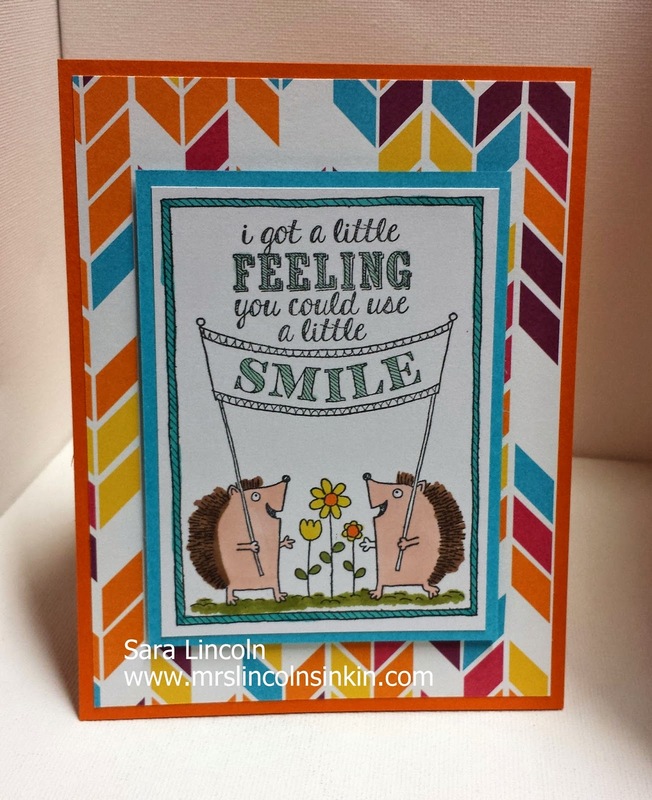 The stamp set that i used today is called A Little Smile. It's a single wooden stamp. Now real quick before i leave you for today, SU! 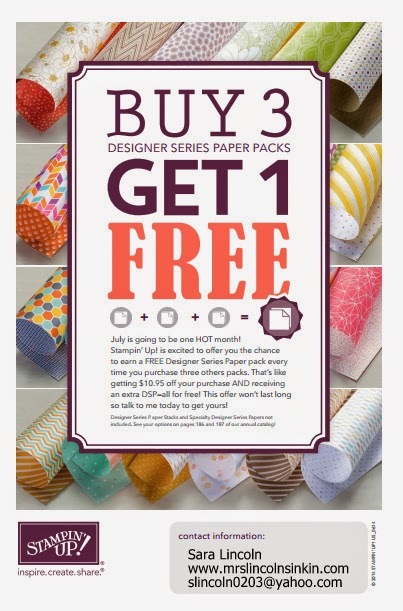 is offering their amazing deal again where if you purchase 3 packs of DSP then you get the 4th pack FREE!! !